Washington (CNN) - Rand Paul has set the stage for an encore. Fourteen months after the Republican firebrand from Kentucky railed against President Barack Obama administration's unwillingness to rule out using drones on American soil - and the lack of judicial justification for such hypothetical attacks - Paul vowed on Thursday to deliver a repeat performance. This time it’s over the President’s nominee for the U.S. Court of Appeals for the First Circuit. 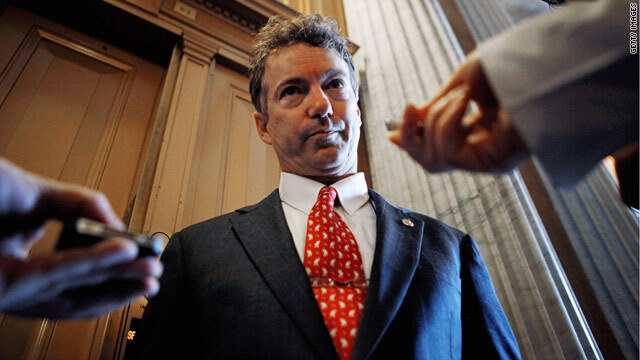 "I shall not only oppose the nomination of David Barron," Paul said in a statement, "but will filibuster." Barron, a Harvard law professor and a former acting assistant attorney general for the Obama administration, authored at least two controversial classified opinions justifying the potential use of a drone strike against American citizens - an effective death sentence - without a trial. After pressure from several voices in the Senate, including Paul's, the White House agreed to show some of Barron's work to senators. While acknowledging he could not reveal the contents of the memo, Paul said the documents contained "no valid legal precedent to justify the killing of an American citizen not engaged in combat." Or, more simply, Paul said, "I am not satisfied." While the Fifth Amendment forbids the premeditated killing of an American outside of any battlefield, the administration and the Bush administration before it have attempted to extend the definition of what constitutes an immediate and unacceptable threat to United States citizens. In a New York Times op-ed published Sunday, Paul argued for the White House to release redacted copies of the opinions to the public and harshly criticized the Oval Office for attempting to elevate one of their authors, Barron, "one level below the Supreme Court." "I can't imagine appointing someone to the federal bench ... without fully understanding that person's views concerning the extrajudicial killing of American citizens," Paul wrote. "But President Obama is seeking to do just that." waged a 13-hour talk-a-thon last March over his drone concerns to delay a vote to confirm Obama's nominee at the time to run the CIA, John Brennan. While Paul said then that he did not believe the President would "drop a Hellfire missile on a cafe in Houston," he called his outright refusal to rule out that possibility troubling. "When he was a member of this body, he had a much higher standard on civil liberties than he seems to (have) now," Paul said last March. Just imagine if George W Bush was resposible for killing over one hundred thousand Iraqi civilians without due process. That would really make Rand angry. It will be interesting to see what tactics the GOP take to kill Rand from the selection at the last minute. Like with his dad, it's all fun and games until the polls actually show the people want to elect him. Then it's out with the big guns to kick him out.